As you know, I was kicking around the idea of doing a free webinar training about how to easily find new clients that you love working with. A couple of days ago I sent an email asking for feedback about what you’d most want to see covered… and the replies that came in were AMAZING! Staying busy during the off season. Promoting yourself for the right kind of work. We’ll cover all of that and more during the live training on February 21st. I want to make it as accessible as possible, so you can choose from two times: 11 AM or 4 PM CST. 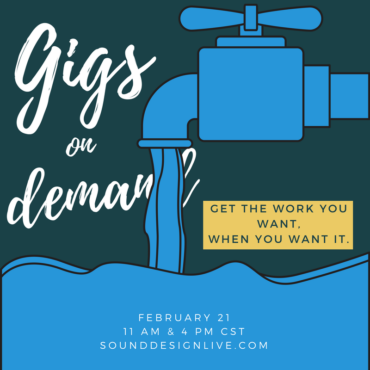 I’m calling the webinar Gigs on Demand. Making the leap from taking on small bits and pieces of paid work to actually making a living in audio. Finding consistent gigs to grow & establish yourself. Finding work that you actually enjoy doing. Getting noticed for your skill in audio, not just lumping and dumping. It’s going to be fantastic, and you’re going to get a lot out of it. Mark your calendar and join us live on February 21st. P.S. We’ll be doing a live Q&A session at the end, so make sure to bring all of your questions. As a bonus, you’ll also receive the Sound Design Live eBook just for attending!